Kaelyn Garcia was born and raised in Detroit, Mi. She graduated with a BFA in Fine Arts from Columbia College Chicago in 2009 and soon after relocated to New York to work in the fashion industry. Kaelyn has worked with numerous design houses as a knit designer and embroidery designer. 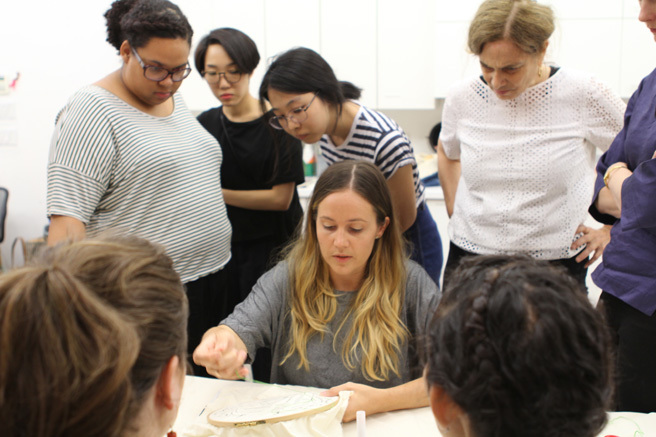 She soon realized that she had a passion for teaching and started working as an instructor at the Textile Art Center in Brooklyn, NY in 2010 and hasn’t been able to stop since. She teaches weaving, embroidery, lace-making, and millinery at the Textile Art Center and offers workshops in the NYC and Detroit area. Join Kaelyn at our studio for her 2 hour Embroidery Sampler Workshop! In this 2.5 hour class you will learn the basic techniques of embroidery using decorative, line, and fill stitches. Students will experiment with cotton, silk, and metallic threads along with learning how to transfer their own designs for their next project. Friend rates available here.